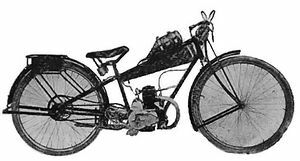 1)	Touring type, 123 cc engine, bore and stroke mm 55 x 52, “Salmson” magneto ignition, “Amac’ carburetor, cone clutch, two speed gearbox, chain drive, wheels 26" x 1” ¾. 2)	Sport type, 98 cc engine, bore and stroke mm 49 x 52, “Salmson” magneto ignition, “Amac’ carburetor, cone clutch, two speed gearbox, chain drive, wheels 26" x 1” ¾. One of the Bruzzesi brothers, Poerio, started to race in local competitions (Chienti and Potenza Motorcycle Racetrack, road circuit Tolentino-Paterno Hill), with varying results. These models were in production for all of 1925 till the manufacturing stop in 1926.